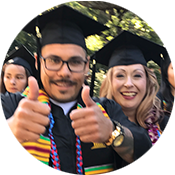 Gavilan's High Tech Center provides specialized courses, assistive software, adaptive equipment and trained staff to empower students with disabilities to meet their educational goals. The skills and knowledge a student gains in the High Tech Center can be taken to other campuses, universities and ultimately, to the work place. The key to computer access is Assistive Computer Technology, hardware and software designed to provide effective, independent interaction between an individual with a disability and the computer. This technology uses specialized hardware and software modifications to enhance student productivity. The technology, for example, permits students to "read" or "magnify" the screen and "type" with their voice. 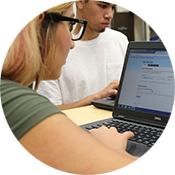 Additional software programs are available for students to improve both their writing and reading comprehension, as well as, their study and memory skills. Everyone can benefit from learning technology! Students who are blind can use a screen reading program that reads the screen aloud via speech synthesizer. Students with low vision can enlarge text and graphics on the monitor and use screen reading capabililities. Students with reading difficulties can learn to use a program that scans text and reads it aloud. Students with writing difficulties can use a program which highlights their writing on the monitor as it reads it aloud. Students with learning disabilities can use word prediction and grammar checking programs to improve their writing skills. Students with physical disabilities can learn to use a speech recognition program enabling the computer to recognize their speech. Students with physical disabilities can utilize adaptive equipment to access the computer. Assistive Computer Technology Courses Offered!